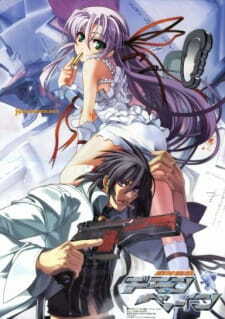 To give the viewer context for what they will watch, this OVA was a special bundle release with the Play Station 2 release of the video game series by Nitroplus that bears the same name. Both of these were based off of a 2003 eroge novel that combined Lovecraftian fictional elements with a futuristic mecha environment. Despite the interesting concept of the original source, we are left with what essentially is a 24 minute preview/trailer for the game, understandable given the background. While its intentions are known, this anime fails to give justice to original work. The story derives its point of view from a reporter, whom while being the source of the plot progression seems only to be a bystander to the actual plot of the anime. This is clear when one realizes that the actual main cast from the source is nearly absent throughout this adaptation. Even further, the viewer is treated to a fast-paced and loaded plot that attempts to dump the entire story in a simultaneous gesture of raising interest. What this does however is leave the viewer in a state of confusion with too much information to digest into a coherent narrative. It would not be wrong to assume that, alone, this anime would be a parady of several anime of the 90s, such as Mobile Suit G Gundam and Macross 7, as well as using many of the common anime tropes that have assimilated themselves into the mainstream. The characters are archetypal and unmemorable, only accompanied with this fact even further by the convoluted presentation and execution of the plot. The animation and art itself provides an arguably strong point for the anime, with complementary visuals and color for its setting. However what will probably turn off many viewers is the use of 3D during the mecha battles. Since being an early 2000s anime of low budget and concern, the noticeable flaws in the movements and sequences may irk the meticulous mecha fan. There is also a certain attack that one may recall from a certain popular mecha anime that was listed above that is clearly reused. The sound is done well despite the drawbacks of this anime, with a decent seiyuu performance and a pleasant ED. At its best, this is an average anime that began with an interesting concept and the opportunity to provide a introduction for the game it was bundled with. Unfortunately this anime squandered this expectation, leaving a trail of many unanswered questions and scratching heads.